I meant to write a blog entry yesterday, but I simply didn’t have it in me after four games of the Northern C Divisional tournament at Four Seasons Arena. So I decided to write one today after six more games. Day 1 of girls’ action on Wednesday featured four sluggish games where neither team was able to sustain offense. Much can be made of the fact that the Four Seasons is a much bigger venue than most Class C schools and the bigger court and more depth beyond the backboards can throw off depth perception and alter shots. Day 2 featured two girls’ loser-out games and two girls’ semifinal games sandwiched around four first-round boys’ games. There weren’t any surprises on the boys’ side as all four district champions moved on to the semifinals. Dutton-Brady got the day started with a 63-61 thriller over Big Sandy. The Diamondbacks trailed by six at the half before coming back for the win. Highwood, the defending state runner-up wasted no time as it jumped out to a 26-6 first-quarter lead over Denton. Highwood is one of the smallest schools in the tournament, but the Mountaineers go nine players deep, something of an aberration for schools of that size. The big early lead allowed Skogen to rest his regulars in anticipation of Friday’s semifinal and beyond. Great Falls Central made its first divisional tournament appearance since 2004 – the first year the tournament was held at the Four Seasons. Unfortunately for the Mustangs, they lost star Glenn Bliss to a knee injury in the district final against Highwood and drew No. 2 and unbeaten Roy/Winifred in the first round. 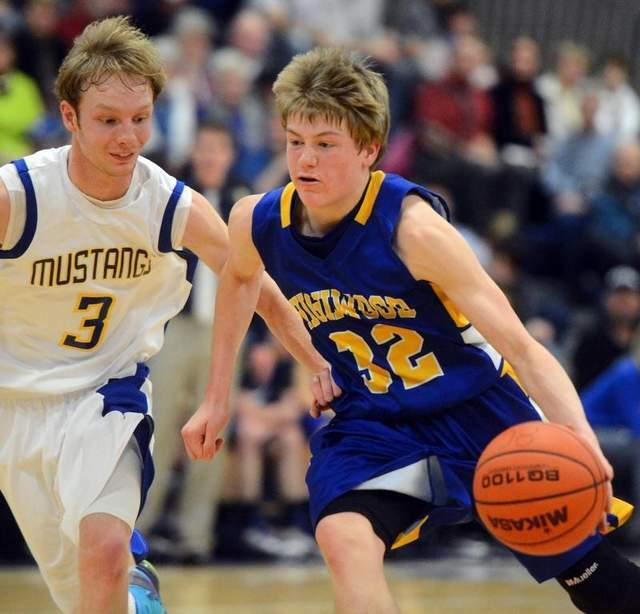 The Mustangs hung tough for awhile before ultimately falling 53-39 to the Outlaws. Still, the boisterous GFCC crowd never wanted, even when it became apparent the Mustangs were going to lose. In the final boys’ game of the night, Box Elder outlasted a plucky upset bid by Simms, which has become the underdog darling of the 2013 postseason. Simms upset Valier and Heart Butte at the district tournament to reach the district final where it fell to Dutton-Brady. The Tigers couldn’t keep the magic going against Box Elder as the Bears prevailed 68-62 to earn the semifinal matchup with No. 2 R/W. The evening wrapped with the two girls’ semifinal games. Belt pulled away from North Star late and Winnett/Grass Range held off Chinook to create a No. 1-vs.-No.2 divisional final. Action resumes at 8 a.m. today with loser-out boys’ action. The boys’ semifinals are at 4 and 5:30 while the girls’ final is at 8:30.